It is easy to shrug off student theatre as amateurish, but ‘Barred’ is a refreshing reminder of the capabilities of students who are brave enough to experiment. This enjoyable and thought-provoking piece made me optimistic for the theatre scene of the future. ‘Barred’ used a bar at Antwerp Mansion as a performance space. 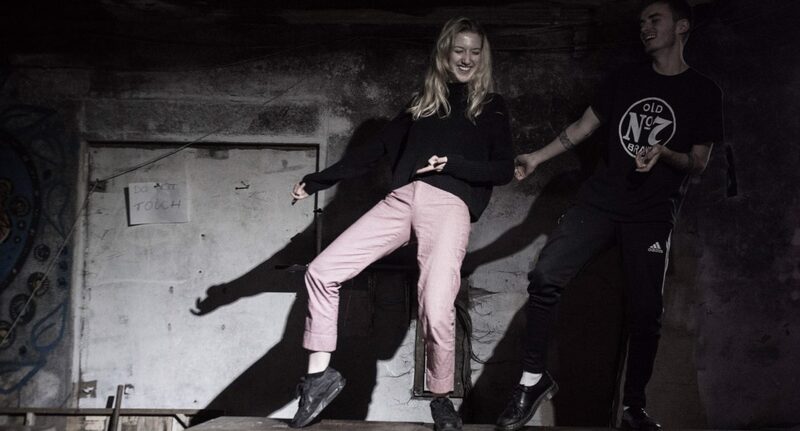 The rehearsed improvisation performance was directed by Libby Williamson, and devised by Williamson with performers Callum Dibbert, and Imogen Hayes. It was based upon real life stories of working in catering. It was very easy to become immersed in the world of the play as we received a free shot upon arrival, served by the performers already in place behind the bar. The grimy atmosphere of Antwerp contributed to the creation of this world. You could believe that the grotesque stories were true because we were in Antwerp, a great manipulation of the space. In keeping with this world that the performers created, there were two breaks in the performance where the audience were invited up to buy another drink. The theatre etiquette protocol of sitting in silence in a dark room, doing everything in your power to stop the performers from noticing that you exist, was subverted to great success. There was a relaxed atmosphere that somehow made it easy to be completely absorbed by the performance. It was a slow-burner but I had a lot of fun whilst watching, not always the case in theatre. There seemed to be three distinct acts, each split by a wave of audience members excited to buy a drink from the actors. In the first act the setting (two bartenders’ first shift together) and the characters (one a seasoned pro always with a story that trumps the last, the other a ‘woke’ newbie with a sheltered background) were introduced. There was a delicate progression in the pace and relationship between the characters as they gradually bonded over horror stories from past shifts. The second act introduced stories of sexual harassment in the workplace, cleverly snuck in beneath the light tone carried through from the first act. This provided a sobering moment when you realised the seriousness of what was being described. In the third act, that relatable feeling of everything being hilarious near the end of your shift was clear. At this point, the characters no longer had to impress each other and were just sharing their lows. There were some pretty radical impressions of your typical customers that everyone in the room seemed to know. By the end Dibbert and Hayes were bouncing off of each other, and the audience were hanging off their every word and movement. ‘Barred’ had such a light and effortless tone, yet managed to deal with mature themes in a sensitive way. It intelligently portrayed themes of sexual harassment, gender roles, class, and night-out culture, and demonstrated the way these influence people’s behaviour in bars. Dibbert and Hayes’ groans through clenched teeth exhibited the way we deal with and respond to inappropriate behaviour — showing mild discomfort and pretending it didn’t happen. By showing this lack of reaction, ‘Barred’ brings into question why we accept such behaviour, and why we bend over backwards for the ignorant customers we serve for minimum wage. The main thing I have taken from ‘Barred’ is how impressive it was that Williamson, Dibbert, and Hayes could do so much with so little. I found it engaging, motivating and very, very funny.